ONEIDA, TN - Big South Fork National River and Recreation Area will be hosting the 19th annual Spring Planting and Music Festival on Saturday, April 27, 2019. Traditional arts and crafts as well as music will be included as part of the festival throughout the day. This park would like to extend an invitation to all interested crafts persons, musicians, and volunteers to participate in this year’s festival. National Park Service policy regarding arts and craft sales does allow for the sales of demonstrated arts and crafts. 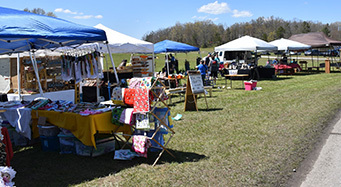 A one-time fee of $25 is required for craft vendors interested in selling crafts or for musicians who wish to sell their music items during this one-day festival. This fee can also be applied towards an application to be a part of the Storytelling Festival on September 21, 2019. All crafters and musicians will need to bring their own tent, table, chairs and equipment. Generators are not permitted. If you are interested in selling your craft and/or music items during this year’s event, contact Letitia Neal, Fee Program Manager, at (423) 569-7321, or tish_neal@nps.gov. Applications are available online. Volunteers are always welcome to demonstrate their craft and/or skills. Volunteers are also needed to assist with event activities. Please contact the park’s volunteer coordinator at (423) 569-9778, or via email at effie_houston@nps.gov. For additional information on this special event as well as other events, visit nps.gov.